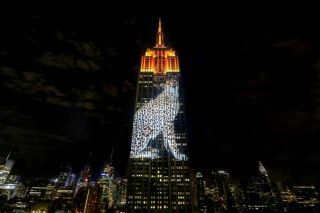 New York City’s Empire State Building was the setting for a projection mapping display highlighting the plight of many animals facing extinction. 26 Christie Roadster HD20K-J and 12 Christie Roadster S+22K-J projectors displayed the collaboration between Travis Threlkel, chief creative officer and co-founder of Obscura Digital, and filmmaker and photographer Louie Psihoyos, executive director of Oceanic Preservation Society. It was the fruit of a four-year struggle to bring attention to some of the world’s most endangered animals. The animated light show measured 375 feet high and 186 feet wide and covered 33 floors of the city’s famous landmark. A leopard sitting on the side of the Empire State Building.